Max. Lenght x Width – cylinder head to fixed under the table 45.9/32" x 17.3/4"
Valve seat - Boring - min. ~ max. 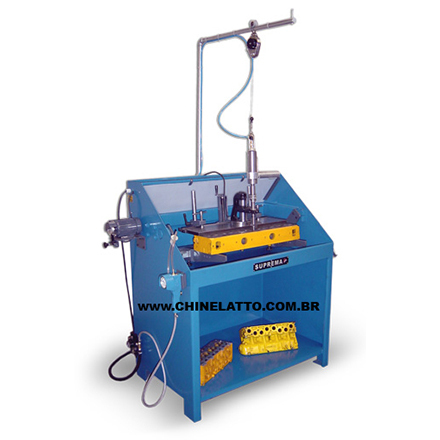 diameter Ø 3/4" ~ Ø 2.3/8"
Distance between the base of support of the cilinder head and the mordant 9.1/16"
Diameter grinding wheel Ø 2.3/4"
Machine Dimensions (Length x Width x Height) 63" x 31" x 85"
Running Machine Dimensions (Lenght x Width x Height) 63" x 31" x 85"
- 04 Allen Tools: 2mm – 3mm – 3/8” - 5/16"
- Kit Multi-valve for milling diameter 9/16" ~ 7/8"